Three Cultivar Red is a Chinese black tea from Red Blossom Tea Company in San Francisco. It has no astringency or bitterness and the taste is much like a nice Oolong. I blogged about this delicious tea on May 8, 2013.
difficulties and can't put the link here. Sorry, but I won't be back to blogging until my major Internet issues are solved. I didn't begin watching Downton Abbey until well into the third season. in less than 2 weeks. I ordered and watched Seasons 4 and 5 the same way. Season 6 arrived at my door Tuesday, January 26th, just as Amazon promised. I promise not to give away the story line as the season continues on PBS. over the last several years. These are called Milk Jugs and Sugar Bowls in England. Perhaps because milk is added to tea and not cream. FYI - cream is too heavy for tea. The sugar bowls are no more than 3 inches in diameter and less than 2 inches tall. The creamers (or should I say milk jugs) are about 2.5 inches tall. They are various patterns and from different English potteries. the photo at the top of my blog. I use these small sets when setting the table with different teacup and saucer trios. Nothing matches, including the teapots, when setting the table this way. However, all the pieces are pretty English Bone China. The photo below is an example of my table setting for high school seniors. I enjoy setting the tea table in this simple, but pretty way. in our cozy home during the Winter Storm of 2016. We ended up with 14 inches of snow falling on Friday and Saturday. That was on top of the 3 inches from Wednesday. School was cancelled in our little town Wednesday, Thursday and Friday. due to wrecks caused by the ice that arrived before the snow. Our church became a Red Cross shelter on Saturday. rural county school buses can travel. I am thankful my family is safe and warm. I enjoy receiving surprise gifts in the mail, don't you? The current teapot is a Tardis from the popular Dr. Who TV series. is the bright white snowfall we are having in Kentucky today. Martha thoroughly researched the perfect Dr. Who foods for this tea party. trip to England in 1995, the tea tin and cookie. Three Jelly Baby candies were also included. At Martha's suggestion I replaced the cookie with gluten free cookies. 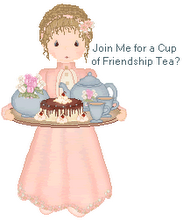 Martha, thanks for including me in this special tea party. I have never watched Dr. Who, but I certainly enjoy tea parties! Just glad I could party inside. Finally, I put away the rest of my December teacups. England storing their teacups this way. But, due to lack of space, I have to stack a few teacups (below). but I hope you don't expect a tour of those! two shelves along with a few pieces of Shelley. Also, Aunt Ida's chocolate set is on the top shelf. I rearrange all my sets of dishes and teapots from time to time. show up at her door last week. Guess who rescued her? after a trip to the vet and several injections. Austin thought about naming her Lady Grey or Darjeeling. Glenn wanted to name her Miss Kitty. But Austin settled on Kitty Rose. For now, she is on the sun porch, my favorite place for a morning cuppa. he suggested we go to lunch so he could have spoonbread. To his surprise, I said "yes" to lunch for the two of us. I had the Stuffed Portobello Mushroom, but forgot to take a photo. He is very generous about offering to run errands these days! The Victorian Girl is the winner of this pretty book. I sent an email to Susan to confirm the address. tiny book of TEA and TREATS. Therefore, I am having a giveaway of the new copy of this pretty 143-page book. in a comment by Sunday, January 17th at noon Eastern time. I will announce the winner by Monday morning. was one of my tea-themed Christmas gifts. one white tea blend, and four herbals. I received this pretty "Grandma's Tea" silver teaspoon from Peyton. I look forward to tasting the teas and using my new pretty teaspoon. as declared by The Tea Council of the USA. to start the New Year with a sound mind and body." Cafe and Tea Room brewed as an iced tea. This tea is described as "sweet, smooth, and summery." According to the instructions on the package, it is delicious hot or cold. For this review, I brewed it as a hot tea with the water temperature around 195 degrees F.
This Mango Green has a delightful aroma and taste. It was a very smooth afternoon cup of tea. of green tea daily for healthy aging. to remove damaging free radicals. the benefits of Green Tea for women.